Want to increase the speed of your writing? Blogging is stressful. It’s time-consuming, and there’s not always time to write. What if I told you that there are ways to cram more words into your blog post in a shorter period of time? You might be doubting me but it’s possible! When I am at my peak writing speed, I write 2,000 words per hour. That’s a lot, but of course, there are time spent “behind the scenes” in order to be able to write that much. Even if you write 1,000 words per hour, that’s extremely good. In this article, I’ll give you my secret tips to writing 2K words by restructuring your mindset, and the way you write blog posts on. When I first started out blogging, do you think I outlined my blog posts before starting to write? I was a newbie who wrote walls of text in my posts. 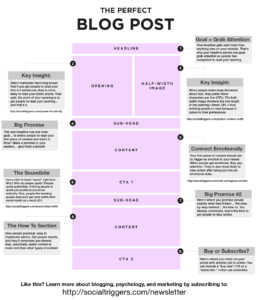 Outlining your blog post means setting up the structure of it before you even start writing. For example, if you’re doing a “5 ways to use Instagram”, write down what those 5 things are, and number them just like you would when making the subheadings in your blog post. I have found that when I outline my blog posts before I start writing, my brain gets filled with ideas on what I can include in my post. So I write them down in the post. The worst thing with blogging is staring at your screen without having a single idea on how to start, but outlining your blog post helps prevent that. Not only will they lead to making your content more readable because you’ve split it up into digestible pieces – before you’ve even begun writing. Making an outline of your content will also make it easier to write, because you won’t have to think about what you are going to write about. With outlines, it tends to come more naturally. This leads to less thinking and more writing! Apart from writing the X tips in subheading form, I always write down the questions I know people might have, and that I am going to answer in my article. This will help you write an article that can help answer every single question people who come across your article might have. Believe it or not but I hate to start writing. But once I’ve got started, I love it. And once I’m really into it, I’ll write over 2K words without any problem. It’s starting that’s problematic, and I know I’m not alone. If you are one of those who have a hard time getting started, welcome to the club. You sit down at your computer to start writing, only to catch yourself having spent valuable minutes just staring at your screen without writing a single word. You’re thinking and thinking but can’t think of a good way to start nor what you’re going to write. The quality of the content you write doesn’t matter. You’re only creating an outcast. There’s plenty of opportunity to return and edit and improve your article once it’s done. There’s two scenarios of “Not starting”. First, there’s the “I cannot come up with anything to write”. Then, there’s the “I’ll do it later”. Which of these do you think is most harmful for your efficiency in writing? If you don’t sit down to even try to get started, you’ll definitely not get any words written. Sitting down and start writing demands discipline. But most of the time, it’s about creating a habit, that is ultimately evolved to a lifestyle. Ever heard of the expression “It takes 21 days to change a habit (or create a new one). 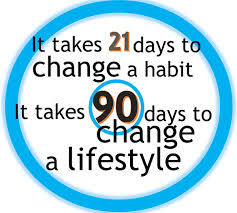 It takes 90 days to chance a lifestyle”? If you do something for consecutive 21 days, you’ve created a habit. But if you fall out of it, that habit might end, which means you’ll have to start all over again. If you write for 90 days, you create a lifestyle. There’s no chance you’ll be able to write high-quality content while at the same time bashing out 2K words per hour when you’ve just gotten started. If you only write blog posts every now and then, it will be harder for you to improve, as opposed to writing on a regular basis, such as every day, every other day, or even weekly. The bottom line is: the more you write, the better you’ll become, and the faster you’ll be able to write. – Without damaging the quality of your post with speed. I call it: write more, write more. When you write more, you’ll be able to write more. Both hourly, and as a whole. When you’ve created a lifestyle of writing, you’ll want to write! Sure, not every single day will be great, and you might not be excited to start writing every time. But in blogging, you’re in it for the long-haul. You can’t know everything, even if you “should” be an expert at the subjects you are writing about. There just are some things we need to look up every now and then. I’ve found it extra effective for me to do most of my research before I start writing – and then fill in the spots that were missing. If you read a similar article as the one you’re writing, there’s a risk that you’ll copy some parts of it because you think it sounded good. When you read articles around the subject you are about to write about, you’re getting different perspectives to the subject, statistics you weren’t aware of, and other things that will help you increase the speed (and quality) of your writing. Nothing kills blogging productivity more than an empty brain. By doing research before you start writing, you’ll save time by not having to hop back and forth because you have no idea on what to write (and risk copying the article you’re reading). I’ve also noticed that when I do research on the subject before I start writing, I get excited to start writing immediately. After I’ve done some research, my brain is full of ideas that I want to jot down before I forget them. This is also an important part of the outlining. Apart from only writing headlines and subheadings, short sentences that describes my idea relevant to point X helps me get more ideas on what to write once I’ve got started. If you’ve just got a brilliant idea on what to write, make sure you write it down immediately so you don’t forget it. It might take some time to do so, but it will also mean you’ll have to think less when you reach that section of the post. You might think that you’ll be most productive when sitting and writing for hours and hours without any pauses. – Unless you have the gift of writing for that long and still be at your peak performance, pauses are necessary when writing longer articles. If you want to get more done, a 5 minute break might be well worth the investment, because this means that you’re performing at your best at all times. Plus, after taking a break. you will return with fresh eyes and hopefully some new ideas. Of course, pauses are most important if you’re writing long articles. For short articles, I often write them without taking any pauses. But that’s because it works for me! 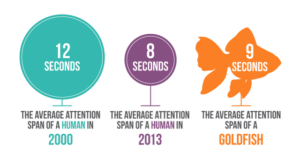 After all, it’s proven that humans have a shorter attention span than a goldfish. If you can’t focus for more than half an hour, or even 15 minutes, take a short break, because you’ll be more productive. The more you write, the better, and more experienced you become. But that doesn’t mean you should push yourself to write 10,000 words a week. If you force yourself to write, even when you’re sick, ready to crash into bed, or physically/mentally exhausted, you’ll face two issues. The first one is that the quality of your content will drop. If you’re writing at times where you’re falling asleep mid-writing, chances are you won’t even understand your own writing the day after. The second point, and this is important, is that you risk blogging burnout. If you just keep going and going without listening to your body, you’ll eventually pass number 3, number 4, and end up in the 5th state, as seen in the image below. 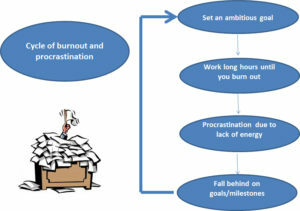 Can you see that burnout is equally bad as procrastination? That means doing absolutely nothing! 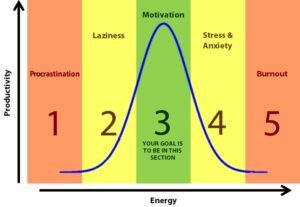 Your goal is to be in number 3, where you are motivated to take on the world with your keyboard. This is only achieved with passion and motivation from within. If you push yourself to your breaking point in the belief of being more productive, it’s false. If you’re not feeling like writing one day, why not do research, make some outlines of a few articles you can write further on? Does this image show how your writing cycle work? If so, maybe you should rethink your writing strategy. Because trust me, you’ll be far more productive long-term. After having written over 600 articles, I can say that this is a big one when it comes to bashing out content. And let me tell you, the difference between writing an article about a subject you’re genuinely passionate about and something that you aren’t too interested in is huge! Of course, you won’t be able to choose all of the time, but when you can, make sure you choose something you’re passionate in, and that you’re educated in. Most of the time, you’re educated in the subjects you’re passionate about, simply because you love learning more about it. In other words, they go hand-in-hand. When you write about something that you’re not highly interested in, and not educated in either, you have to constantly be fact checking, researching, and figuring out the next sentence to write. Thus slowing down your writing significally. When I write about subjects I am not extremely passionate about, the time it takes to write a blog post is dramatically increased. And let me ensure you, I am far away from writing 2K words an hour during those circumstances. If you can choose, write about a subjects you’re passionate about, because writing will be both more fun, and people will sense it in your blog post. Plus, you’ll have an easy time writing 2K+ words per hour, if you’ve followed all the other points. Writing is an art that takes time to master. Studying, and learning from others is helpful. Writing fast isn’t always a good thing. If you’re writing 2,000 words an hour, but the content you produce is the terrible, what’s the purpose of writing fast? Nobody will read it anyway. The key is to write high quality content. 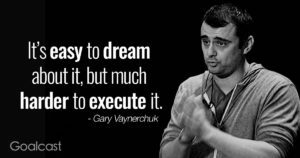 And if you can do it quickly, perfect! 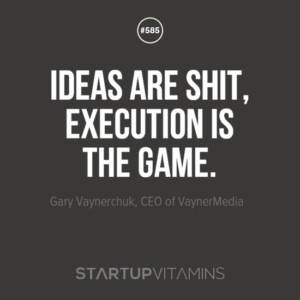 As you execute and practice writing, you’ll automatically become a quicker writer. Follow the tips that helped me write faster while maintaining a high standard, and speed up your writing. Do not forget to use a Plagiarsm Checker like https://searchenginereports.net/plagiarism-checker/ to check if your article is similar to another article on the web which you have taken information from.